Freedom Mobile finally launched iPhone sales back in December, marking a defining moment for the company to truly compete against the ‘Big 3’. But it hasn’t been all fun and games for some iPhone users on Freedom Mobile, as new activations and people porting over from Rogers, Telus or Bell have been suffering from iMessage and FaceTime activation issues. Many iPhone users on have been voicing their displeasure on Reddit, with some waiting up to 11 days for iMessage or FaceTime to finally activate. People are able to send messages with their Apple ID, but iMessage and FaceTime won’t work with their Freedom Mobile numbers. For now, there is not quick fix, other than waiting for iMessage to eventually activate on Freedom Mobile. Some users noted to make sure you had “+1” before your phone number via Settings > Phone, as that may help resolve this activation bug. iMessage activation issues aren’t exactly new to longtime Freedom Mobile customers, as before when it was known as WIND Mobile, users had similar issues activating iMessage on their iPhones in 2015. The issue appears to linked to the Freedom Mobile network—we’ve reached out to the company for comment on this issue and will update this article accordingly. 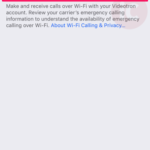 Have you had any issues with iMessage and FaceTime activation on Freedom Mobile?